Trevor Plouffe’s 2014 was quietly impressive. With super prospect Miguel Sano out for the season with UCL surgery, there was little pressure to Plouffe’s job security. Some believed he would not be able to respond without the push but not only did the 28-year-old infielder make strides at the plate, supplying value in the lineup as a run producer, he turned a corner in the field as well. 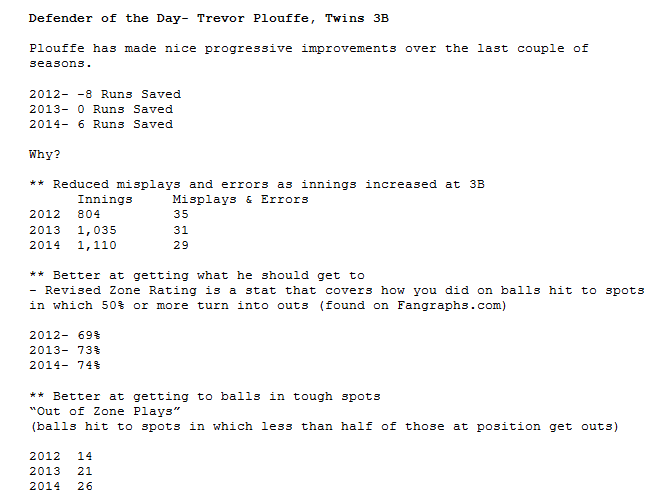 Simply put, Plouffe has increased the amount of runs saved by reducing the number of errors and misplays (plays that don’t result in outs but are not necessarily errors), converting on more of the plays that are in a standard third baseman’s zone, and increasing the number of out-of-zone plays. According to BillJamesOnline.com, Plouffe finished ranked 12th among third basemen in runs saved. Ultimate Zone Rating says he was sixth. Inside Edge’s Fielding rated him 23rd in terms of making the plays right at him this season. While the last one might be a bitter pill, all of those stats show progress in his defense. He has come a long way since his inaugural season at third. What has led to this improvement? This first factor is simply better throws. Early in his career, a lot of his misplays and errors were a product of his throws. He was coming off a season in which he made 11 throwing errors at short and continued that in 2012. In his first season at third, Plouffe demonstrated a side-arm slinging motion when throwing the ball across the diamond. That year, while playing 801 innings at third, he made eight throwing errors. That was the sixth most among third basemen with a minimum of 500 innings yet the ones ahead of Plouffe found themselves with nearly twice as many chances. Additionally, after reviewing clips of his plays, opportunity for more errors were there had veteran first baseman Justin Morneau not saved some of his offline throws. How will Ricky Nolasco perform in 2015? FSN's Marney Gellner joins the No Juice Podcast to talk Twins. Will Phil Hughes regress next year? And be sure to buy your Winter Meltdown tickets here.